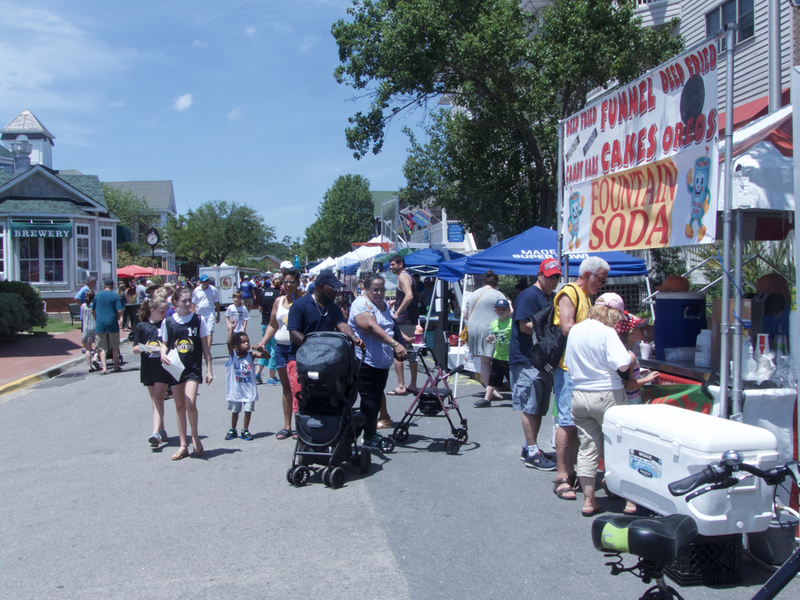 Manteo Dare Day–street fair and county fair rolled up into one celebration. If Norman Rockwell were alive today, he would travel to Manteo to paint the perfect picture of small town life. Saturday’s 43rd Annual Dare Day was about as ideal a day to throw a part welcoming summer as there could be. The weather was wonderful—a little warm, but not too bad, bright sunshine and no rain at all until much later in the day. For anyone who has not had the opportunity to go to Dare Days, imagine a small town that is also the county seat for the County deciding to though a County fair. Only it’s more of a street fair than anything else, with the downtown area closed off. Filling sidewalks and spilling into the road are lots of food vendors, booths filled with crafts and art of all sorts, authors were on hand to sign their books, and live music all day. And we can’t forget the Blue Ribbon Prizes awarded for the best homemade goodies in nine categories…everything from cookies and candy to pickles and salsa and relish. Highlights of the day? That’s hard to say. The Pirate demonstration put on by The Shadow Players Stage Combat Group was a lot of fun. They maintained a running dialogue with the audience, were funny, entertaining and informative. The whip demonstration was particularly good. Special mention has to be made of the music—especially the Rhondels. Based out of Virginia Beach, back in the 1960s they were one of the hottest groups around. They’re still really good, although the original members aren’t in the group these days. The reason they are getting a special call out is they braved what might have been the coldest Outer Banks New Year’s Eve on record to perform outdoors at the Manteo New Year celebration. They probably deserve the great weather they got this time around. There’s always something special happening on the Outer Banks. Find the perfect home to be a part of Outer Banks life at Joe Lamb Jr., & Associates.